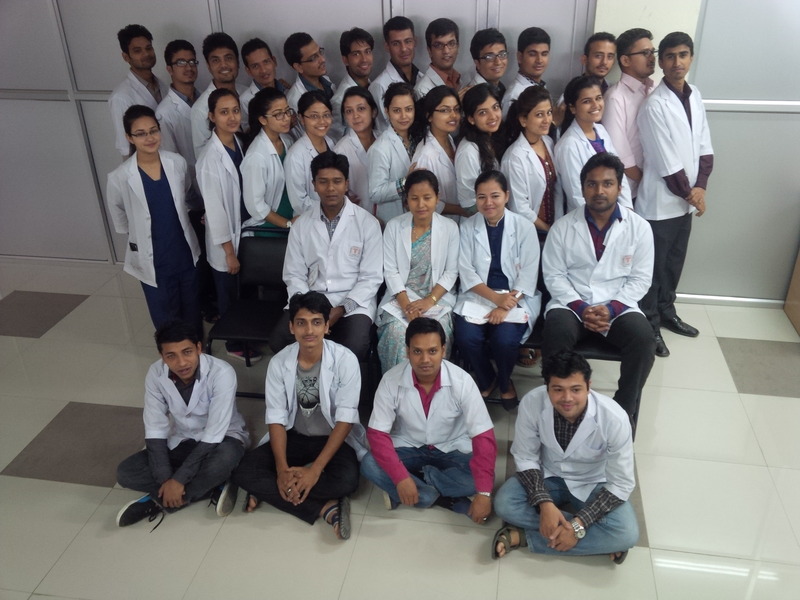 CCNEPal is a small #NGO with one mission: teach Advanced Cardiac Life Support in #Nepal. For months, we planned a “road trip” outside the Kathmandu Valley with twelve sessions. We made 500 sets of handouts, printed 500 certificates, pre-positioned our teaching supplies, and at each location there was a contact person to alert the future participants as to where and when to appear. We now have completed four of the twelve, at P.U. in Biratnagar and CMC in Bharatpur. The group in Biratnagar was 47, more than my “usual” but I had the help of Dipty Subba and fine support of P.U. administration. We talked about ways to collaborate with the entire P.U. system next year. that would be bindass! We teach two similar versions of our class. The 3-day version is for nurses. They have not had as much science as the docs have had, and we spend more time going over ecg when we teach them. The usual curriculum of nursing school has not covered ecg, though more and more B Sc schools are including ecg in their senior year work ( due in part to our promotion of this subject and providing them with teaching materials). 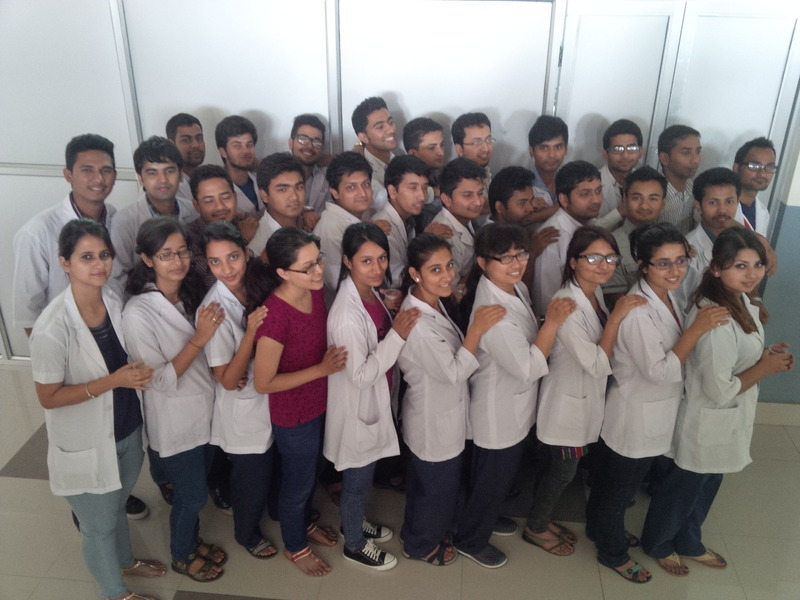 CMC batch #1 of senior MBBS students. Seated are my four assistants for the session – without them the teaching would not have been so good. At each location, the goal is to develop local expertise and experience in running these kind of courses, and I have told CMC administration that I thought CMC was amply ready for this leadership role. The 2-day version goes straight to the protocols and skills needed to perform and lead a team. We use the protocols of the American Heart Association, with specific adaptations to reflect the current medical practice. For example, certain pieces of equipment are not widely available here and for some of the drugs a less expensive substitute is used. batch #2. 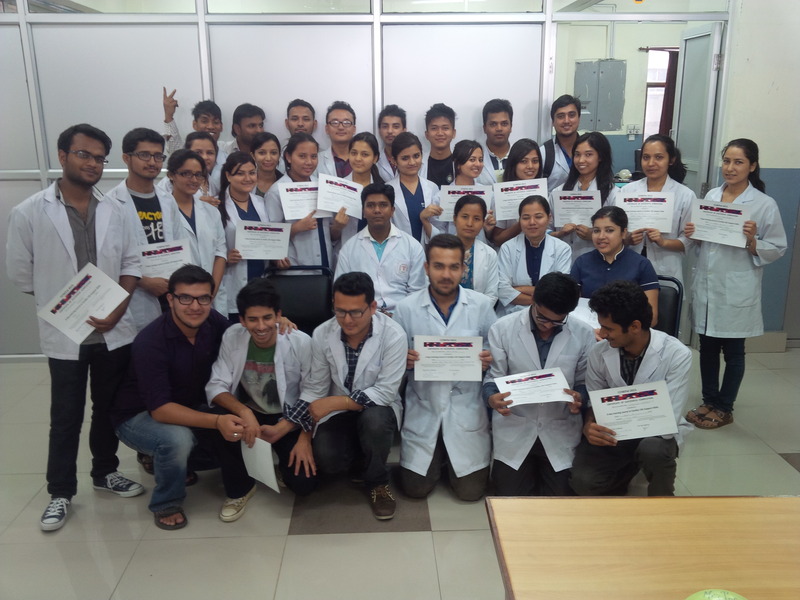 Until 2014, CCNEPal focused mainly on nurse training, and we had trained hundreds of critical care nurses throughout the country in our 3-day course. For MBBS we compress it to two days, and it’s go-go-go from the moment we start. the growth they show, in skill and confidence, is rewarding. CCNEPal has taught 62 sessions of this training since it’s inception in 2011. Like in the USA, this is not a lecture class. Consistently, the students are surprised by how practical it is. Much of the class consists of simulated patient situations. The team of instructors guides the student in role play and gives feedback on performance. There are prop we use to make it more realistic, but we keep these inexpensive and low-tech. For example, we use a set of child’s playground balls instead of CPR manikins. These can be deflated for travel. Right now, the best time for new doctors to take this training is during the final months of MBBS program, before beginning their internship year. MBBS students are taught to make the most use of resources, in case there is not enough to go around. Batch #4 from CMC showed the same spirit and work ethic as the previous three. I encourage all the MBBS students to share with others, as to the value of this training. Their testimony and support will do more to promote this than I ever could do…..
with eight sessions to go, the Road Trip is turning out very well. The students have been great, and in particular, the support from CMC has been wonderful. In my opinion, CMC needs to develop more as the regional resource for this kind of medical training – they are more accessible for the Terai region than Kathmandu will ever be, and the expertise is excellent. In the meantime, you can see a lot more pictures if you go to the FaceBook page for CCNEPal. If you wish to learn more about the specific challenges of Nepal health care, you can read one of my two books that described boots-on-the-ground bedside care and decision-making. The second is a novel titled “The Sacrament of the Goddess” – I chose that format to keep it readable. Click here for a review in Nepali language. You can get this novel in Thamel at Vajra Books, and it has a cult following among young docs and nurses in Nepal. Oh, and it is available in USA too! This entry was posted in medical volunteer in Nepal and tagged #globalhealth, #globalsurgery, ACLS in Nepal, Advanced Cardiac Life Support, CCNEPal, critical care nursing in Nepal, emergency nursing in Nepal, JoeNiemczura, medical education in Nepal, Nepal Society for Critical Care Medicine, nursing education in low income country. Bookmark the permalink.